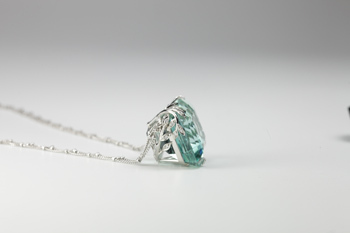 The magnificent, perfectly square, flawless natural Aquamarine weighing 60.00 carats has the color of tropical waters. 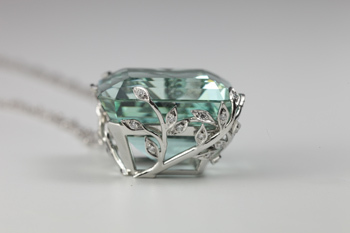 The blue green crystal draws you into it’s depth, like looking into the sea. This explains the root of the its name Aquamarine. Asymetrical hand fabricated diamond paved leaves “climb the trellis” to hold the gem, all suspended by multiple platinum chains with tiny platinum beads within the chain. There will never be another, truly one of a kind!